Fill out your order form and submit it. From there we can calculate the tax, shipping, and handling cost and get your total. Upon approval we will process your payment and get started on fulfilling your order. There is a $235 crate core charge. In some cases is will not make sense to return the crate due to shipping cost. Starting cost: Bare metal no options $1,259.99 - $1,714.99 plus tax, shipping, and handling. Add Powder Coating. $195 Weld in 1 1/4" side receivers for various attachments (inside table and hammock). $35 Weld in recessed mounting brackets for flush mounting LED Fog Lights wiring and switch included. $145 Weld on 3rd and 4th set of D rings for tow bar attachment. $35 Weld in flush 2" front attachments receiver. $45 Cut out vehicle in tow harness hole if you are planning on hooking a tow bar to your westy. $0 Pre-drill 4 USA license plate holes. $0 Pre-drill 4 holes for optional winch. $0 Pick up you order at our Chico location and receive free installation. $0 Shipping requires custom crate. Core charge $235 if it is cost effective to return the crate we will let you know. Starting cost: Bare metal no options $1,199.98 - $1,539.98 plus tax, shipping, and handling. 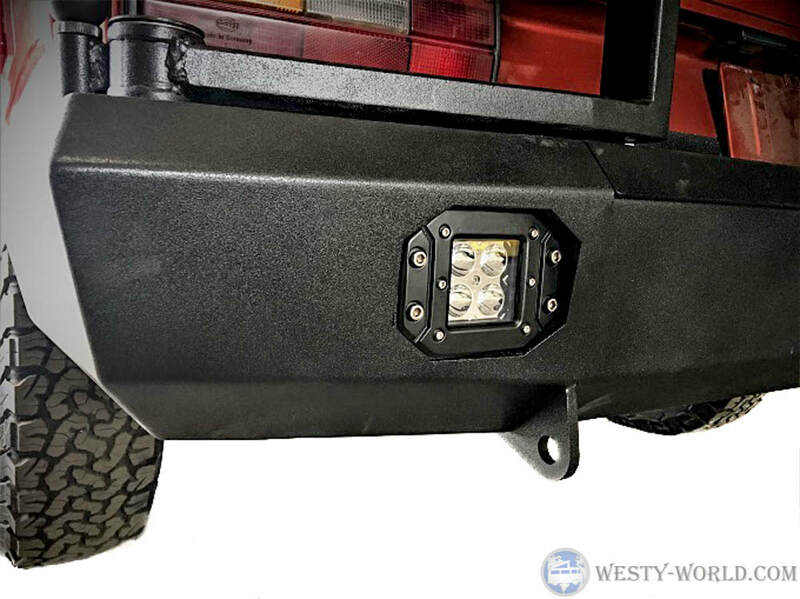 All Rear HD Bumpers include: Locking storage box built into the bumper, rear 2" receiver welded in place, 2 D rings, and 2 safety chain rings. To get a total with shipping quote pick all items you would like and we will calculate your total after you email this form in. Folding Tray above spare tire or mount anywhere on universal carrier. Large locking storage box with 2 drop down tables and built in tray. Trays that mount to swing arm with logo and without options. If you have a business address cost will decrease.